After reading a blog post by Donah at Sweet Jelly Bean about spring cleaning your blog, I thought I'd have a go while I'm sat down on my lunch break. 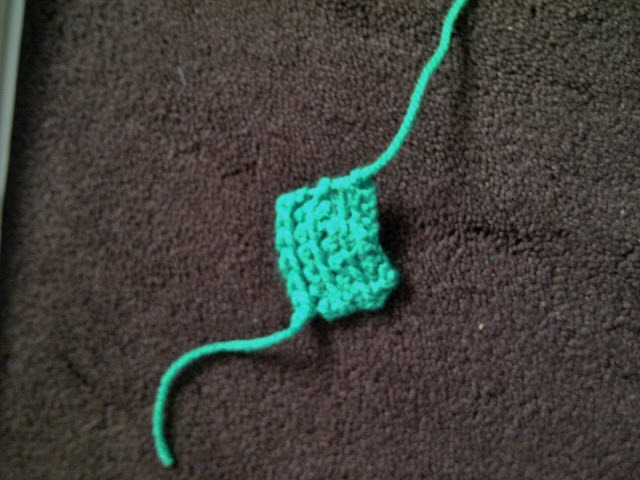 I looked back through my old blog posts and I found my first attempt at crochet! Whenever anyone asks how I got into crochet, I can never remember, but here it is, sat on my blog. It's not the most detailed blog post by any stretch, but it does at least tell me what inspired me to try the craft I find myself indulging in most nights. It's quite fun to see how I've improved from that tiny 3cmx3cm square now too and to look at all the lovely things I've made since! And by August I'd managed to crochet a whole teddy! Thankfully my photography improved a little along the way too! I'm quite impressed with all the different things I've managed to try, and largely I'm happy with their success! I still try to wear my hat (although I made it a little bit big and I've had to try and shrink it with elastic!) and Hope is sat in my Mum's living room.